Full range of drilling cycles. Center drilling, drilling, tapping, reaming, boring, helical milling, thread milling and mill drill cycles give the user a choice of operations to cover any combination of hole type. Selection of diameters and depths straight from the model makes it easy to enter drilling parameters and eliminates the possibility of errors. 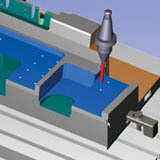 Optimization of the toolpaths ensures the shortest distance for the tool travel, saving machining time on complex hole patterns. 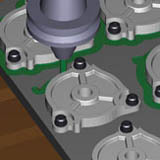 Toolpath verification and simulation. Once programmed, the job can be simulated in realistic rendered solids. PEPS Milling automatically checks the tool and the holder against the model and fixturing and provides a warning when there is going to be a collision, both graphically and via on-screen warning messages. Graphical verification of the completed toolpaths shows the sequence of operations and the surface finish. 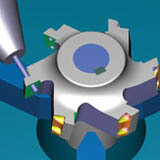 The cut part can be compared with the original model, to ensure that the part has been completely finished. Using visualization helps to make sure the job is made right first time.